A renovation is the perfect time to redesign the flow in your kitchen. Look at a renovation like a clean slate. You’ll have the opportunity to create your dream kitchen. But are you familiar with the steps to create this dream? How about the Work Triangle concept? Do you have an idea about what type of layout you want to go with? That’s were our “Plan Your Kitchen” eBook comes in. The “Plan Your Kitchen” eBook is in three sections. We walk you through the steps of measuring your kitchen. We cover how you should measure your walls, windows and doors as well as the ceiling and soffits. Understanding the Work Triangle explains what’s important for a cook. The Work Triangle is the heart of your kitchen design. This is how the cook will work between the refrigerator, sink, and stovetop. Read up to know how to use this technique. Choose between five different layouts. Each layout gives a brief description and where they would work. You’ll have a better understand of what you might be looking for. 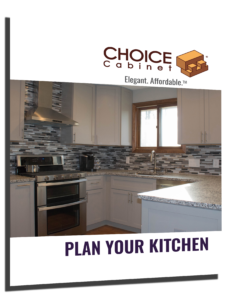 Download the “Plan Your Kitchen” eBook. Provide us a little information about yourself. Finally, click “Submit”. We’ll redirect you to our download page!